Homework station ideas and study spot ideas are something I work on during the summer months so that when we head back to school, we’re ready to hit the ground running! Plus, a little summer studying to keep their brains sharp is never a bad idea! I expect a lot out of my kids. Let’s face it, they have it so easy compared to most of the world. They have a nice home, clothes, food to eat, and an assortment of extras like sports fees that could buy me a small car. I expect them to get As and to work hard in the classroom. Maybe they’ll even get scholarships and I can convert their college funds into my retirement account. Win, win! So when it comes to homework station ideas, I’m all in. My boys both have homework spots in their rooms, but do they use them? Rarely. Most of the time they’re down in the living room or the kitchen, wherever I am. Don’t get me wrong, I’m not complaining, I prefer for them to be in the common areas than to being locked up in their rooms. But it does mean that study supplies must be nearby. I don’t have a spare drawer to use for homework supplies, but I do have a spot to stash this cute pencil, pen and paintbrush carousel. Just one of the necessary items for a great study area. Want to make one? Its vinyl, not a sticker, so I can change it out without damaging the carousel if I ever want. It would be darling on a glass jar, small vase, anything you have handy to hold pens and pencils. The ART design is from my Back to School Cricut cartridge, Rule The School. In addition to the art graphic, I have English, Math and Science. You could use them all on the caddy, or on notebooks, or drawers organized with supplies. The possibilities are as endless as your ideas! Design – open a new project in Cricut Design Space, select image, in the top right corner search cartridges for Kim Byers Rule The School. You’ll see tons of designs, select the ART graphic. Measure – measure the caddy, drawer front, or whatever else you’re going to place the label on. Now size the design in Design Space to fit the object. Print – load the printable vinyl in your printer, and print. It will come out with a thick black box around the design. That is what the machine reads so that it cuts perfectly. Cut – place the print on a standard or light mat and cut. Label – peel the vinyl off the backer and attach to your caddy, drawer, bin, etc. Now that you have this cute little homework station caddy, where to store it?! These ideas are darling enough to be right out in full view! Colorful Reading Nook – create a colorful reading nook like Clair, Collected made. These are perfect for out of the way corners and bedrooms. Not only will the kids have a dedicated spot for homework, but also for art and reading. I can just imagine all the laundry I could have gotten done (when they were younger) while the kids were occupied in this special spot. 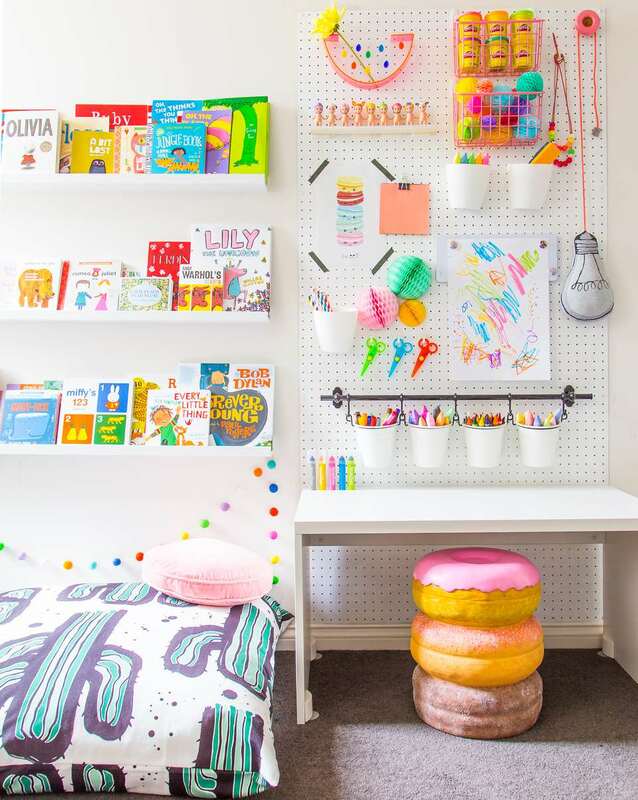 Simple DIY Wall Desk Study Spot – this homework station idea is perfectly tucked away and on one of those walls that most people would see no potential! This study space idea is from Remodelaholic. Want more ways to use your Cricut to create amazing home projects, kid projects, mom projects and party projects? I’ve got you covered!